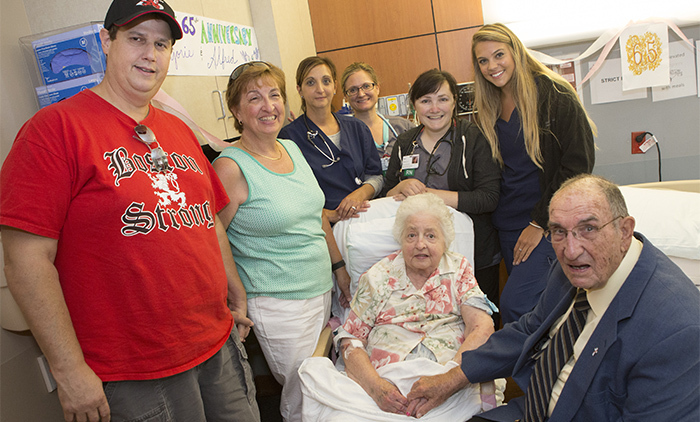 Al and Marjorie Balestracci recently celebrated their 65th wedding anniversary at Winchester Hospital. Picture from left to right: Richard Kellerman, Lisa Kellerman, Marjorie and Al. In the back row are Winchester Hospital nurses Ciana Vernon, Brooke Bevan, Sheila Krain and Cynthia McIrney. Winchester, MA – In 1940’s Mystic, Connecticut, Al and Marjorie Balestracci were next door neighbors who knew each other only in passing. It wasn’t until they were set up by friends to go to the prom together did they finally interact with one another. Little did they know that, for the rest of their lives, they would be side by side, in sickness and in health. Before leaving for the Korean War, Al asked Marjorie to be his wife and they were married soon after. Six children and 65 years later, in a small third floor room of Winchester Hospital, they were about to say “I do” all over again. In honor of their wedding anniversary, the North Reading couple had planned to celebrate their marriage milestone out to dinner together. Unfortunately, their plans for celebration were no longer possible, as Marjorie was admitted to the hospital. Al knows that because his wife suffers from Parkinson’s disease, this will not be her last stay in the hospital. “But she put up with me for 65 years, didn’t she?” he chuckled. It turned out that their monumental anniversary was also the day Marjorie would be moved to a rehab facility to recover and soon be able to return home with her husband. Rather than let the day go uncelebrated, they organized a vow renewal ceremony with the help of the hospital staff and their long-time priest. A special lunch for the couple and a room full of streamers, photos, and flowers preceded the makeshift ceremony. Al and Marge’s youngest daughter, Lisa Kellerman, and son-in- law, Richard Kellerman, were able to make the ceremony along with four of Marge’s nurses. Richard said that the hospital had gone “above and beyond” in the care of their mother. “You would just never see this kind of thing in other hospitals,” remarked Richard, a nurse and nursing professor himself. Winchester Hospital, a member of Lahey Health, is the first hospital in Massachusetts to earn Magnet recognition, the American Nurses Association’s highest honor for nursing excellence, three times. As the northwest suburban Boston area’s leading provider of comprehensive health care services, the 229-bed facility provides care in general, bariatric and vascular surgery, orthopedics, pediatrics, cardiology, pulmonary medicine, oncology, gastroenterology, rehabilitation, radiation oncology, pain management, obstetrics/gynecology and a Level IIB Special Care Nursery. Winchester Hospital has clinical affiliations with several nationally recognized hospitals in the region, including Boston Children’s Hospital, Tufts Medical Center and Beth Israel Deaconess Medical Center. To learn more, visit www.winchesterhospital.org.